Grand Anse d’Arlet became our favorite anchorage in Martinique this year. After returning from our brief visit to St. Lucia to meet up with friends, we “waited” here until my cousin Griet and her family showed up a few days later. We worked for the business and made the necessary preparations that are required for a guest family of four. Since we are not a big fan of Fort-de-France (busy and rolly), we delayed our short sail around the corner until the last moment, which was the morning of June 30th. For some reason, that was also the day a lot of bad weather passed through and we were obliged to take down all the sails and motor dead into heavy wind and built up waves, while we endured squall after squall coming down the bay, barely making progress towards Martinique’s capital. When the evening approached, safely at anchor, it was still raining big time and we sure hoped for a break, once our visitors would reach the area near the dinghy dock. After darkness had totally set in for an hour, I took the dinghy to shore with a handful of garbage bags (to keep the bags dry) and noticed “the sign” - a flashing flash light - indicating Belgian presence ashore. Our guests had arrived and were ready for a stay on Irie. It was dry for 15 minutes; thank you Weather God. We managed to haul all the luggage onboard and assigned the starboard cabins. Griet and Wim moved into the forward cabin and their kids Sam and Eva into the aft one. Previously, I succeeded in moving all the stuff normally taking up these spaces (computer, Wirie parts, and miscellaneous things) into other cavities in the boat. The first few days were pretty rainy and many a meal was had inside. Or, we would move all the items onto the cockpit table, only to be welcomed by raindrops once we sat down. At night, everybody was responsible for closing and opening and closing and opening their own hatches. We became used to it and managed to still do things and get off the boat, whether it was a walk through Fort-de-France or a snorkel with turtles in Grand Anse d’Arlet. The second day was spent tacking along the southwest coast of Martinique to reach the cute town of Ste. Anne. Wim turned into a helpful crew member and confident helmsman, while the kids had a blast on the trampoline, every time a wave would crash under and over them. Griet enjoyed being on the water with a big smile, taking photographs. When we are in Ste. Anne, we like to go for a long walk past many small bays and pretty beaches, to the southern tip of the island. The trail is mostly in the shade and the whole experience is a fun daytrip. Unfortunately, we lost half the day with trying to check out (first by bus, which was non-available on Sundays, then by dinghy), since the bar in Grand Anse d’Arlet, where we planned to do this, was closed. When we finally locked the dinghy in town and reached the trail head near Anse Caritan, all the paths had turned into a wet and muddy mess, thanks to the heavy rainfall of the previous days. We splashed and slid and hiked and skidded to the first bay, where we relaxed the rest of the afternoon, together with hordes of local families on a Sunday break. Dinner was had in a local restaurant with a typical Creole dish and ti punch. The crossing between Martinique and St. Lucia was the big sailing adventure. Nobody was allowed on the trampoline and the ocean was respected by all. Irie made great timing, averaging 7 knots, turning this trip into a shorter, but bumpier one than the trip tacking to Ste. Anne. We reached Rodney Bay in time for lunch. The kids stayed aboard, while the adults checked in, explored the marina area and shopped for food. The following day, I dropped everybody off on shore for a visit to Pigeon Island and a walk on Reduit Beach. Mark and I caught up on our usual internet and boat stuff. We all had a very enjoyable dinner in Jambe de Bois, our favorite restaurant in St. Lucia. The tour moved onto Marigot Bay, where the rain didn’t keep us from snorkeling along the rocks, landing on the palm fringed beach and walking along the mangroves and the lagoon. After lunch, Irie and crew moved on to Anse Cochon to snorkel some more in the rain (which didn’t keep one rum demanding boat boy away), gaze at the colorful fish and coral and spend a peaceful night. The next morning, the schedule was similar with a lunch stop in Anse Chastenet, where we swam from the mooring ball to the beautiful black beach and then on to a nice snorkel area around protruding rocks. We continued on to the Pitons for pictures of the spectacular view and another night. When the park ranger came by to collect the fees, he was accompanied by a customs officer, requesting to see our special permit to moor. We didn’t have one, since there is an extra US$10 fee on top of the park fees and since they never checked for this before. We moved around the corner and spent the night in Malgretout Beach instead. Griet, Wim, Sam, Eva and I took the dinghy to Soufrière and walked through the local town and along very lush gardens and forests to the Botanical Gardens. We thought it opened at 9am, waited for an hour and entered at 10am, when the park appeared to open. For the next hour, we smelled colorful flowers, read explanatory signs, stuck our toes in the manmade and swimming pool-like hot springs and looked at the Diamond Falls. After more grocery shopping, lunch was had on Irie, in the cockpit this time! By now, everybody had his own job when the seats were wet or about to get wet. In the afternoon, we returned to Marigot Bay, the anchorage of choice, for another night on a mooring ball. 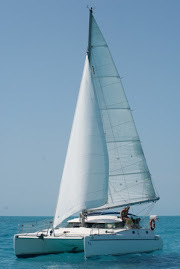 The brisk wind, with gusts up to 26 knots made for a quick and invigorating sail! The gang’s last day on Irie was spent in Marigot Bay, with a walk in the marina area and a drink looking out over the protected lagoon. A short sail to Rodney Bay with captain Wim finished the family’s sailing adventure. Because of its tasty and affordable food, yummy cocktails and great outdoor atmosphere, a return visit to Jambe de Bois took place. This time, we had anchored right in front of the door, so a short dinghy ride kept the passengers dry. The following morning, after a hearty breakfast with Bloody Mary’s (Griet and Wim are good sports trying everything! ), we moved to the southern area of Rodney Bay and I dropped our guests off at the Rex Resort for a continuation of their holiday, in luxury this time!